Amazon EC2 is the cornerstone for any Amazon-based cloud deployment. Enabling you to provision and scale compute resources with different memory, CPU, networking and storage capacity in multiple regions all around the world, EC2 is by far Amazon’s most popular and widely used service. 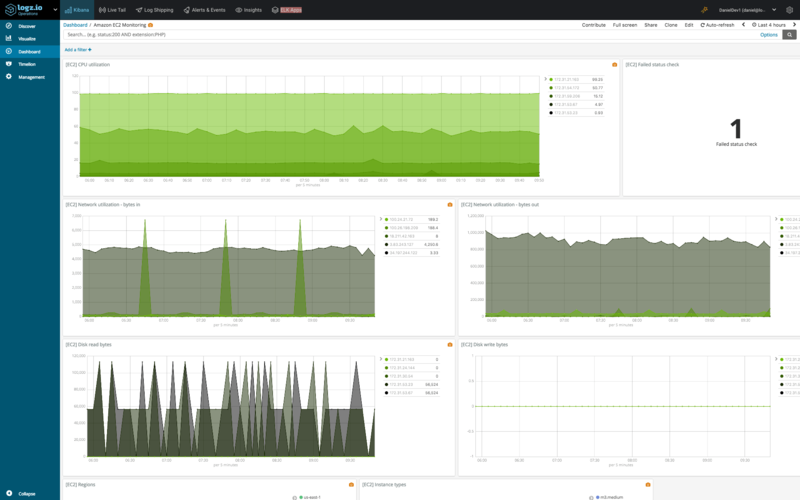 Monitoring EC2 is crucial for making sure your instances are available and performing as expected. Metrics such as CPU utilization, disk I/O, and network utilization, for example, should be closely tracked to establish a baseline and identify when there is a performance problem. 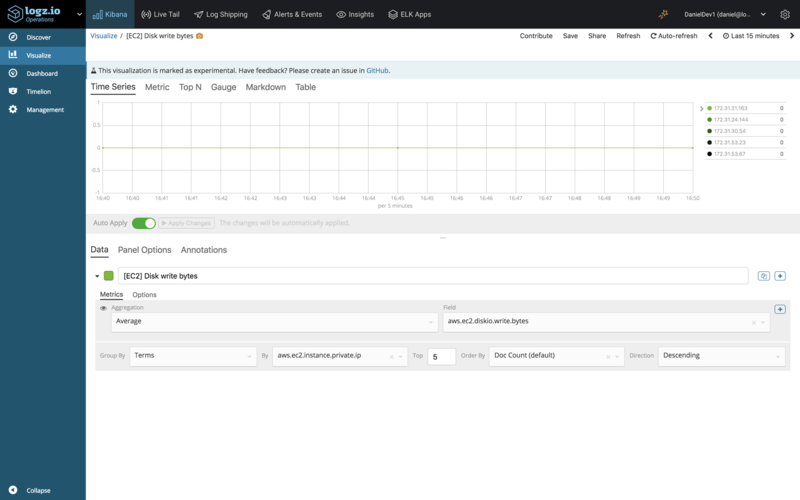 Conveniently, these monitoring metrics, together with other metric types, are automatically shipped to Amazon CloudWatch for analysis. 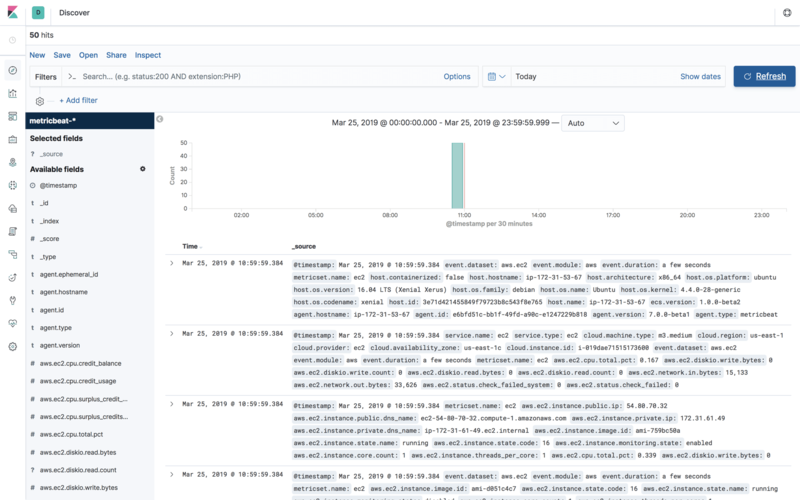 While it is possible to use the AWS CLI, API or event the CloudWatch Console to view these metrics, for deeper analysis and more effective monitoring, a more robust monitoring solution is required. 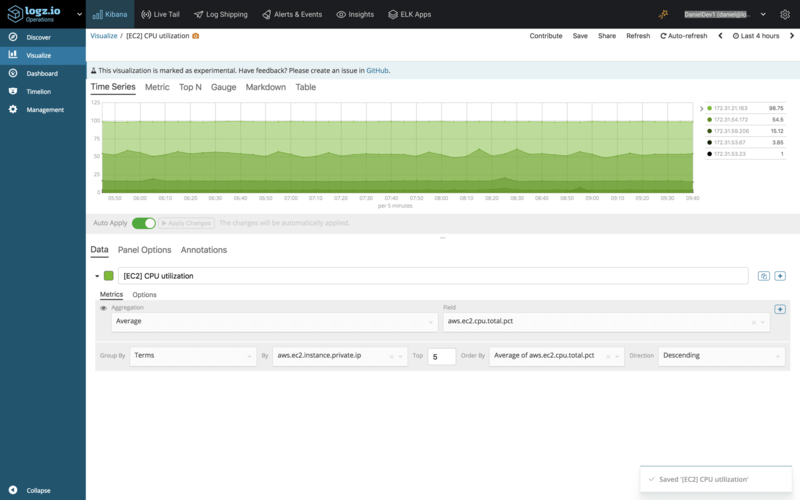 In this article, I’d like to show how to ship EC2 metrics into the ELK Stack and Logz.io. The method I’m going to use is a new AWS module made available in Metricbeat version 7 (beta). While still under development, and as shown below, this module provides an extremely simple way for centrally collecting performance metrics from all your EC2 instances. I assume you already have either your own ELK Stack deployed or a Logz.io account. 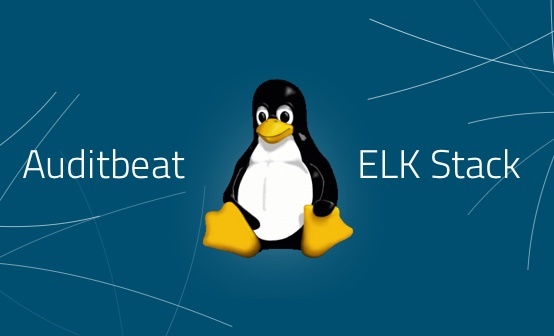 For more information on installing the ELK Stack, check out our ELK guide. To use the Logz.io community edition, click here. First, you need to create an IAM policy for pulling metrics from CloudWatch and listing EC2 instances. Once created, we will attach this policy to the IAM user we are using. Once saved, attach the policy to your IAM user. Metricbeat can be downloaded and installed using a variety of different methods, but I will be using Apt to install it from Elastic’s repositories. Before we run Metricbeat, there are a few configurations we need to apply. First, we need to disable the system module that is enabled by default. Otherwise, we will be seeing system metrics in Kibana collected from our host. This is not mandatory but is recommended if you want to keep a cleaner Kibana workspace. The next step is to configure the AWS module. In this example, we’re defining the user credentials directly but you can also refer to them as env variables if you have defined as such. There is also an option to use temporary credentials, and in that case you will need to add a line for the session token. Read more about these options in the documentation for the module. 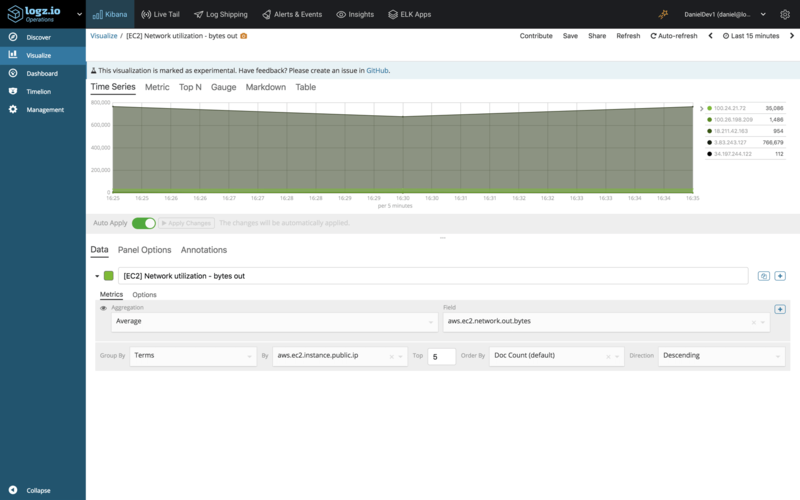 The period setting defines the interval at which metrics are pulled from CloudWatch. 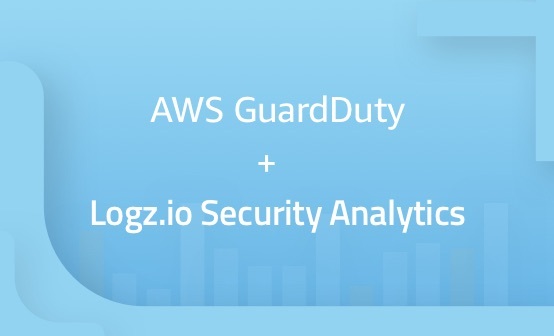 By making a few adjustments to the Metricbeat configuration file, you can ship the EC2 metrics to Logz.io for analysis and visualization. Next, retrieve your Logz.io account token from the UI (under Settings → General). 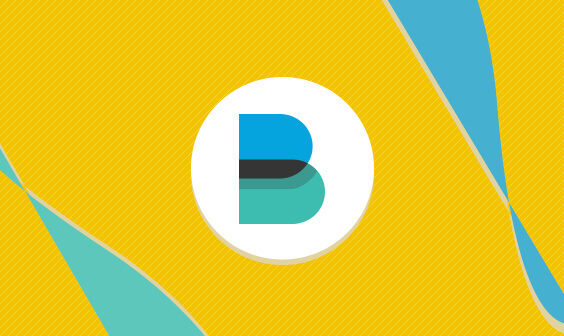 Be sure to enter your account token in the relevant placeholder above and to comment out the Elasticsearch output. Once you’ve built a pipeline of EC2 metrics streaming into your ELK Stack, it’s time to reap the benefits. Kibana offers rich visualization capabilities that allow you to slice and dice data in any way you want. 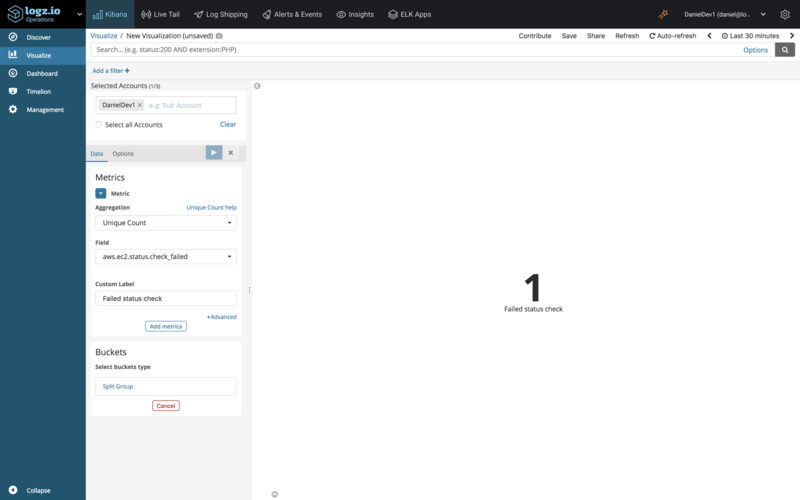 Below are a few examples of how you can start monitoring your EC2 instances with visualizations. 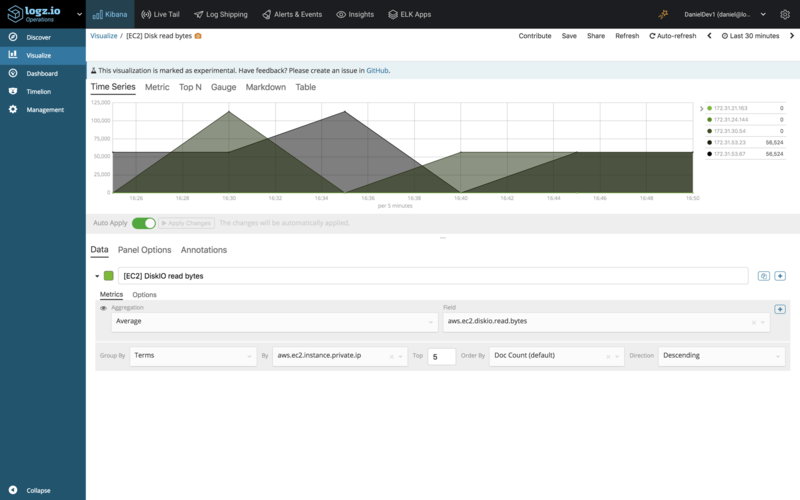 Kibana’s visual builder visualization is a great tool for monitoring time series data and is improving from version to version. The example below gives us an average aggregation of the ‘aws.ec2.cpu.total.pct’ field per instance. In the example below, we’re using the visual builder again to look at an average aggregation of the ‘aws.ec2.network.in.bytes’ field per instance to monitor incoming traffic. In the Panel Options tab, I’ve set the interval at ‘5m’ to correspond with the interval at which we’re collecting the metrics from CloudWatch. 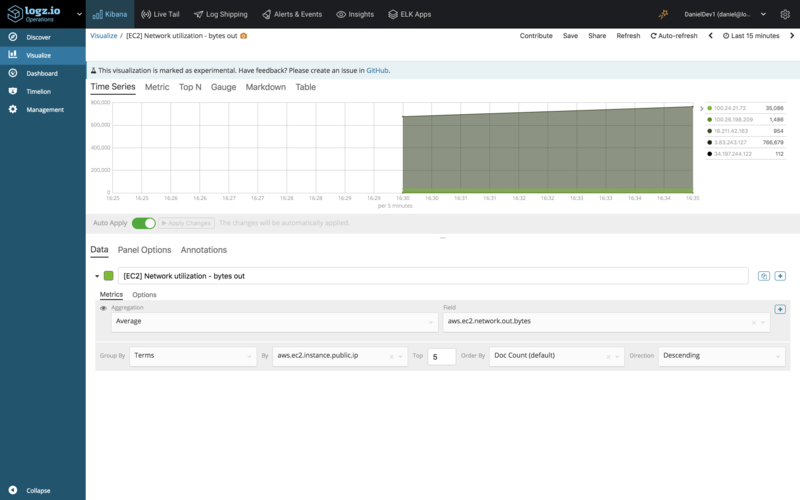 The combination of CloudWatch and the ELK Stack is a great solution for monitoring your EC2 instances. Previously, Metricbeat would have been required to be installed per EC2 instance. The new AWS module negates this requirement, making the process of shipping EC2 metrics into either your own ELK or Logz.io super-simple. 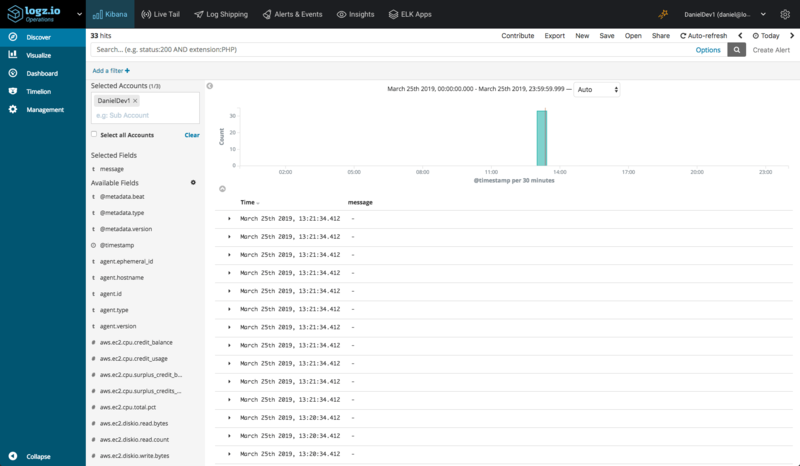 Once in the ELK Stack, you can analyze these metrics to your heart’s delight, using the full power of Kibana to slice and dice the metrics and build your perfect EC2 monitoring dashboard! This dashboard is available in ELK Apps — Logz.io’s library of premade dashboards and visualizations for different log types. To install, simply open ELK Apps and search for ‘EC2’. Looking forward, I expect more and more metricsets being supported by this AWS module, meaning additional AWS services will be able to be monitored with Metricbeat. Stay tuned for news on these changes in this blog! 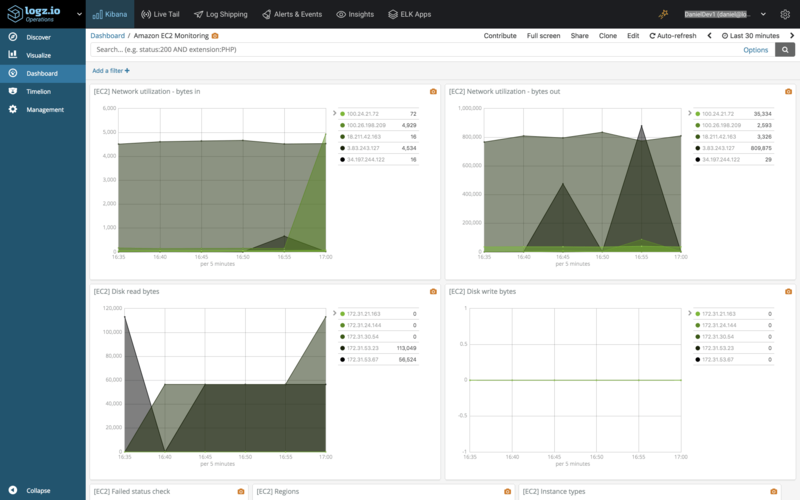 Easily customize your EC2 monitoring dashboard with Logz.io's ELK Apps.